The recent marriage of the Duke and Duchess of Sussex, known also as Prince Harry and Meghan Markle, brought to mind another romance that involved royalty and race. As the Duchess is the first member of the House of Windsor to be of mixed-race (perhaps the second if stories about Queen Charlotte, wife of George III, are true), it seemed a good time to look at A United Kingdom, the true story of an African king and the (white British) woman he loved. 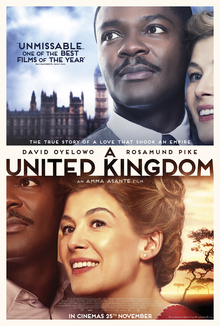 A United Kingdom has a very respectable Masterpiece Theater-polish to it, but it never comes alive to make these interesting people either real or worth knowing about. Seretse Khama (David Oyelowo) is the hereditary head of an African nation, Bechuanaland, currently finishing his studies in England. It is at a dance that he meets Ruth Williams (Rosemund Pike), a typist. They soon quickly fall in love, brought together in part by their passion for jazz. The idea of marriage is firmly opposed by Ruth's father, but it isn't just the whites who are not happy. As Seretse was a child when he inherited the throne, his Uncle Tkeshedi (Vusu Kunene) is also appalled at the prospect of a white Queen. It's bad enough in his view that the British have Bechuanaland as a 'protectorate', but to have them in the Royal household is too much for him. Tkeshedi insists Seretse put away his fiancee and get another one, an African one. He stubbornly refuses to, causing a rift in the Royal family. While his people are not crazy about Ruth, they do love Seretse. However, owing to the rift the British are now slowly crouching in more into Bechuanaland, no doubt helped by the fact that the land is rich in minerals. The British also want to appease the South African regime, one that is fiercely racist with their apartheid policies. Nevertheless, they marry and the rift breaks out into the open. Seretse is exiled, but he wisely advises Ruth to remain, sensing that if both leave neither will be allowed to return. Their relationship soon gets entangled in international politics, as the Labor and Conservative Parties use them for their own needs. Eventually, Conservative Prime Minister Churchill is forced to keep his promise of allowing Seretse to return if his party won the general election, and in the end, Seretse comes up with a better plan: renounce the idea of monarchy and instead push for independence for the new nation of Botswana. We learn that they remained married, with Seretse becoming the first Botswanian President. The issue with A United Kingdom is that it commits a great sin: it constantly and consistently tells but does not show. Again and again we hear how 'this is a great crisis' or 'they are so in love' but we don't see it in the performances or the screenplay. It's very strange that it takes fifteen minutes for us to see a marriage proposal when in those ensuing moments all Ruth and Seretse have done is talk of love but not actually show there was any affection, let alone this burning passion deep within. In fact if memory serves correct, it isn't until half an hour that they even kiss, and that's because it's their wedding night. Guy Hibbert's screenplay seems to want to focus on the political machinations thwarting our two lovers but keeps getting pushed back into focusing on their love affair. I can almost sense the struggle between Hibbert and director Amma Asante as to what story they will tell. We see this when we go to Parliament, and as a side note it's the cheapest-looking Parliament I've seen on film. We see scenes of an agitated Prime Minister willing to sell out the Kharmas to keep South Africa in the Commonwealth, then go into scenes of Seretse crying when he hears his newly-born daughter's voice on the phone. Back and forth, back and forth between what appear to be competing stories, both not interesting thanks to some bad decisions. There's the decision to divide A United Kingdom between political drama and romance. Then there's the decision to make everything so noble, so elegant. The worst is that we again are told but don't see the evolution of the people. Seretse's sister Naledi (Terry Pheto) on first sight openly hates Ruth. At the end, she is her greatest friend. How this turnaround came about we can guess. Oyelowo and Pike are simply too good of actors to be this boring. Asante is too good a director, having made the excellent Belle to have done such a lousy job. It's not a good sign when you spend much time trying to figure out who a particular actor is, one who is devouring the scenery with relish as the 'evil' imperialist, only to realize it's Tom Felton, aka Draco Malfoy. A United Kingdom, as I've said, is very respectable but dry as the Kalahari Desert. This should be a most fascinating story, and the Khamas deserve better.